...let's get WEIRD! For the next meeting of the ol' Final Girl Film Club, let's all try to wrap our minds around the 2000 film Uzumaki. Discover Akiro Higuchi's groundbreaking film, Uzumaki (which means vortex), an aptly named masterpiece about a town gripped with fear because of the menacing march of an otherworldly force that threatens to destroy the area and turn its residents into ghastly snails. Can a young girl, Kirie (Eriko Hatsume), and her paramour, Shuichi (Fhifan), save their homes and neighbors? Or are they the next victims of the unstoppable force? Mmm, a big helping of Japanese cinema with a side of wackadoo. I'm so excited I could puke! You know the drill...link to me in your write-up, then shoot yer URL to me at stacieponder(at)gmail(dot)com. The film is okay, but the original Manga is, to use the parlance of our times, off the chain. Wow, that's a bizarre choice for you Stacie. Been a while since I've seen it, so it should be a hoot to revisit. See you on the 1st! Hmm...bizarre. Mayhaps! Final Girl, I think, made the transition to general "horror blog" some time ago. Whether that's good or bad, well, sometimes I feel not so great about it. There are only so many slasher movies, though, and frankly most of the new ones blow big time. If I watch something like Blair Witch, I want to talk about it here. I'd hate to ignore all the horror going on in my life just 'cause things may not fall under the slasher umbrella. Speaking of manga to film, there was also "GeGeGe no Kitaro" that's been released on R1 here. The story is about two siblings who find a spirit ball, evil fox spirits (Who look a little like Were-Foxes) and the fabled goblin boy Kitaro (The beautiful Eiji Wentz from the duo WaT) along with his friends Cat Girl (Or as I call her, "Kitty"), Eye Pop (His dad's soul inhabiting his eye), Granny Sand-Witch (Who is as her name suggests-a witch who controls sand), Baby Man (Who can drag people down with his weight) and Rat Man (A con-artist of the spirit world) to save the day. I know there's a sequel that was made with the girl from "Kill Bill", but I don't know if that's come to R1 yet. Just added it to my netflix queue... hurry up and get here! Wow. I'd completely forgotten about this film (which is odd, considering how bizarre it is) until I read your post this morning. Can we have something more universally available next time, please? The last 3 films were not been on DVD in the UK. Thx! Whoa. 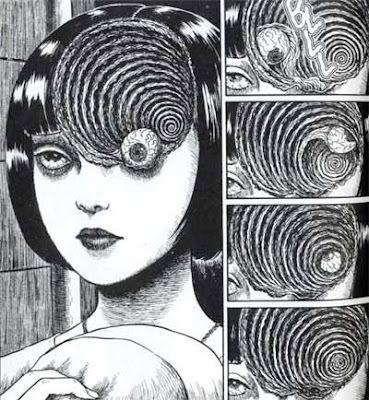 I've never seen this film, but Junji Ito's manga has some of the most horrific, amazing, burned-into-my-brain images I've ever come across. Ito's grotesque visual imagination is unsurpassed. I almost don't want to see his vision translated into film, because the original work is just so great. I'd also highly recommend his other major horror series, Gyo, which starts out being about killer sharks with robot legs, and just gets weirder from there, if you can believe it. It certainly outdoes Uzumaki just in sheer inspired lunacy. I'd be happy to, anonymous, but how do you suggest I do that? I try to make the choices accessible, but I only do this by 1) ensuring it's on DVD, and 2) ensuring it's on Netflix. Is there a UK-equivalent of Netflix? Or should I just check Amazon UK...? I want the choices to be fairly interesting rather than just the newest release...makes it tough some times. Point me in the right direction, though- the more people who watch the movie, the better! Great choice of material for discussion! I saw the film long before I tracked down the manga online to try and understand it better! I felt that the film was good but made a lot more sense when I found it was a condensation of a number of chapters of the manga with some paying off differently and some not paying off at all as if to just nod in the direction of the source material (such as the father and the bucket of mud which pays off in the chapter involving the kiln in the manga but which just seems to show a more general malevolent influence of the lake in the film). Of course the manga is absolutely fantastic, full of images that are too perverse, too epic in scale and too bizarre to turn up in even the wildest movie, with a wonderful vague linkage between seemingly stand alone chapters that gets stronger and stronger until you find yourself on an extremely moving narrative journey by the final sections. Beautifully structured to provide both the comic and jolting jump scares and ironic endings of episodic fare with the slow introduction of repeated motifs and characters we come to care for of a longer work, despite the bleakly inevitable ending (I love bleakly inevitable endings! ), perhaps it would work best as a more extreme version of a kind of Lost-style mini series. For me the film was interesting but didn't quite work as a coherent piece, falling in between being too tame compared to its original material (though it has its moments!) and too confusing and arbitrary for a viewer without knowledge of the source material. However I do think the film had a wonderful atmosphere and spot on casting, so there are some compensations! This should arrive in the mail tomorrow. Sweet. It's funny...a week or two back I looked at this on Netflix and thought I needed to add it to my queue. After reading the spectacular manga (a style for which I am not ordinarily predisposed) the film comes off as a terrible flop. This can be in part excused by the fact that the film was made before Ito had completed the manga and certain liberties had to be taken to bring the film to a "conclusion". The film's visuals at least try to remain true to Ito's unique and (excuse the pun) twisted style and is worthwhile for eye candy's sake. On the whole I would encourage any horror fan to read all three volumes of the manga. The anthology-like stories mesh themselves into quite the disturbing climax with plenty of atmosphere and gut-wrenching depravity. Anon raises an almost-point; Uzumaki is listed on the British equivalent of Netflix (Lovefilm.com should you need it!) but has 'unavailable' next to it. But I think this is only the first time you've picked something unavailable - sometimes they just have different titles here. Thanks for the heads up, Hud...I'll check it out for the next go-round for sure. does the movie end with everyone enjoying some tasty escargot? Sweet! Looking forward to my first film club review. This will also be my first! It takes Junji Ito to get me out of my shell! "Uzumaki" is one of the best manga or comics ever written! He is one of my favorite artists. Also, check out the comic "Tomie" which has several movies made from it by the same name. It is about a beautiful teenager who is also a demon. Men become obsessed with her and then are driven mad and try to kill her, but she always comes back! Pretty cool story and all of Ito's work has a lot of social commentary going on. @Chris Unfortunately, the movie downplays the snail subplot, which was the most horrifying thing for me when reading the manga. This is, again, I'm sure due to the fact that the manga was not completed when they made the film. I finally started a new film blog (after blogging about fashion of all things for the last couple of years) -- I think this should make a good first post, and a WHIRLY SWIRLY new start.